The 1/10 Gold Britannia was one of the original standard releases of the gold bullion coins at its launch in 1987. Remaining the smallest denomination of the coin until the release of the 1/20oz, it is still thought to be affordable for new investors or those with a limited budget. The Britannia is one of the world’s premier gold (and silver) bullion commodities on the planet and rivals other government minted releases in both purity and aesthetic beauty. 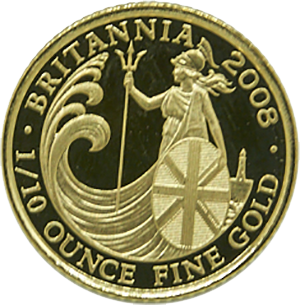 The 1/10 Gold Britannia measures 16.50mm in diameter and has a purity of 24 carats. This changed from 2012, with all coins minted before this date containing a purity of 22 carats. It is therefore essential to ascertain the date of the coin’s mintage before purchasing. The Britannia’s design has remained largely unchanged since its introduction in the late 1980s. The coin’s inverse depicts the iconic, and historic, Britannia figure, which dates back to the times of the Romans and was designed by engraver Philip Nathan in 1987. On the coin’s obverse is the figurehead of Queen Elizabeth II. The only change in the coin’s design occurred with he updated portrait of the figurehead in 2015. Other Gold Britannia denominations include the 1/4 oz, 1/2 oz and 1 oz, which were also a part of the original launch of the coin in 1987. From 2012, the 1/20 oz, and 5 oz versions were minted and are still in production to this date. A special edition 1 oz thinner and larger in diameter than the standard Britannia was also introduced for 2013 only. The 1/10 Gold Britannia is Capital Gains Tax (CGT) exempt, and an ever popular choice for investors in the UK as a result. Due to the coin’s purity, it needs to be stored and handled with care as malleability, always a problem with highly pure gold products, can be an issue.